Standard Paper Colors: White, Sungold. Standard Sheet Counts: Available in 25, 50 and 100 sheets per pad. Shipping: Click here for shipping weights. Catalog quantities ship in only 5-working-days! 2-day service at ground rates. BIC Air Express 1 Day Air. 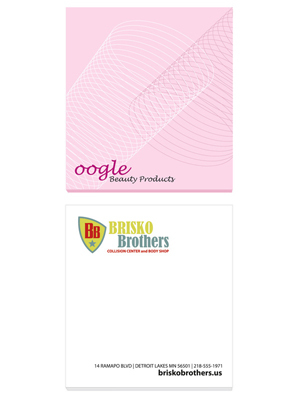 Since BIC Sticky Note products are heavy, click here for complete shipping information. Combination Packaging: Pair any BIC Sticky Note pad with your favorite BIC pen to create a unique combo package!